Home » Posts tagged "canon 7D"
I’m on a mission to capture a sharp image of a dragon fly. I’ve been inspired by one of my contacts on Flickr who captured a really awesome (really sharp) image of one. We have a couple of ponds at work and I’ve been hanging out at one for a little bit after work. These are 2 of the best I shot the other day. Not as sharp as I’d like, but then again I don’t have a $1500-2500 lens. I rented a Canon 7D for my beach trip this year. I also rented a couple of lenses (Tokina 11-16mm 2.8 & Canon 18-200mm). This was my second rental from Lensgiant.com. This image was shot with the 7D and the Canon 18-200mm (f5.0, 1/250, ISPO400). and made this out of 8 of them. 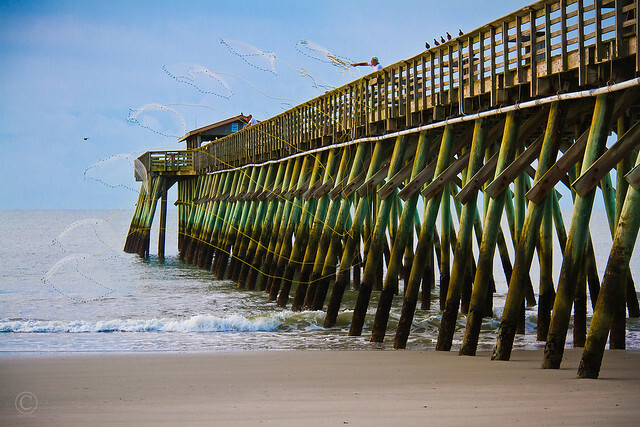 Shot this at the Myrtle Beach State Park Pier at 7:01am on August 9, 2012.
i rented a canon 7D, tokina 11-16mm f2.8, canon 18-200mm lens, and some other stuff for my beach trip in august (flash & filters). before I shipped it off on monday, I thought I’d take some pictures around five stones with the wide angle (tokina lens). i rented the camera and lenses from Lensgiant.com. this was my second time renting from them and i will rent again and again!